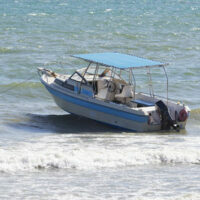 Rental Boat Sinks | Personal Injury Miami Attorneys Alan Goldfarb P.A. The company that rented two men a boat that sank off the coast of Dunedin is now being sued by the men though they suffered no serious physical injuries. The two men claim that they were stranded in “shark-infested” waters for the duration of the time between the boat sinking and their rescue. The company, Pirate’s Cove Boat Club, rented the boat to Nicholas Dudas-Szabo and Mohammed Sameni. The men claim that the boat did not have a flare or a radio when it began taking on water due to a defective bilge pump. When they couldn’t find a radio, they looked for flares, but according to the lawsuit, the flares were expired and did not work. The men were left stranded for hours although they were able to dial 911 and get ahold of the Dunedin sheriff who eventually rescued the men. Though they were not physically injured, they are suing the Pirate’s Cove Boat Club for negligent infliction of emotional distress. The question: can they collect damages from their boating accident? This is not among the most common claims that you will find, particular as the centerpiece of a personal injury lawsuit, but since the two men in question did not sustain physical injuries, it is what they are left to sue for. To their credit, negligence, in this case, is easy to establish. But a successful negligence claim requires that a plaintiff prove injuries. So, here we’ll talk about proof of injury in an emotional distress claim. Florida follows what is known as the impact rule which is only followed by a handful of states. The rule states that the plaintiff must have been in physical contact with something, however innocuous, that resulted from the defendant’s negligence. In other words, the impact rule states that the plaintiff in a case must have sustained some kind of physical injury. This makes Florida one of the most difficult states in which to prove an NIED claim. The rule is very old, dating back to 1893, and has been abandoned by most jurisdictions due in large part to the fact that it simply excludes NIED claims from litigation. More commonly found is “zone of danger” standards which would certainly apply in the aforementioned case. The question, that the court will be forced to answer is whether or not extended contact with the water counts as a “physical injury” that would allow the plaintiffs to pursue a cause of action against the defendants. While this rule is enforced in order to prevent Florida’s courts from being flooded with fraudulent or frivolous lawsuits, there are precious few exceptions that allow even cases like the one above to proceed on their own merit. The plaintiffs would need to show that the psychological stress of the incident caused some other physical condition. This can include panic attacks, anxiety, difficulty sleeping, or things of that nature. Have You Been Injured by Another’s Negligence? If so, contact the personal injury attorneys at the office of Alan Goldfarb P.A. for a free consultation. Our Miami legal team is eager to assist you today.